Cornell professor of civic ecology, resilience, and environmental education. Nature's Do-Gooders: What Difference Do They Make? Last week I assembled a group of nature "do-gooders" at the National Socio-Environmental Synthesis Center in Annapolis MD. And I asked them what difference their well-intended actions really make. First off, you might want to know who these do-gooders are. One is Veronica Kyle of Faith in Place in Chicago, who links stories of African-American migration to migration of the monarch butterfly, and inspires folks to plant milkweed in public spaces to "welcome home" the butterflies. Another is Robert Hughes, who for 20 years has spurred people in his native eastern Pennsylvania coalfields to plant trees along stream corridors, clean up illegally dumped trash, create community gardens at historic mining sites, restore trout fisheries, and otherwise reclaim communities impacted by coal mining and poverty. 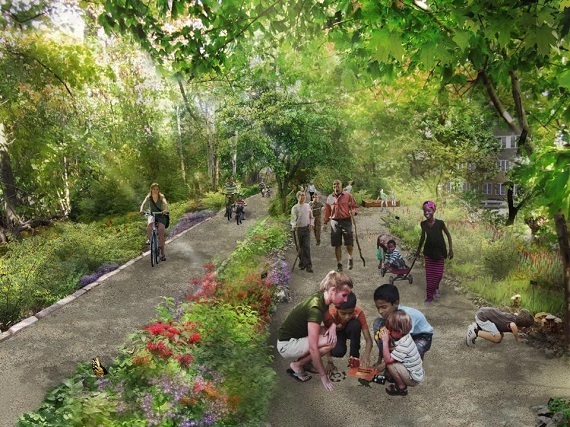 Anandi Premlall came down to our workshop from New York City, where she initiated efforts to convert a 3.5 mile disused rail line to what someday will be The QueensWay linear park and cultural greenway. And representing the Maryland Coastal Bays Program, Carrie Samis shared her work with Coastal Stewards -- youth, primarily from communities of color -- who plant native grasses to recreate "soft shorelines" that absorb run-off and protect beaches. Because these and others assembled in Annapolis care for nature and community, my Cornell University colleague Keith Tidball and I call them "civic ecology stewards." And we call their actions "civic ecology practices." Rendering of The QueensWay. Image courtesy of WXY and Dland. To help understand what these actions mean beyond one community garden, one section along a stream or coastline, or one urban trail, I also invited university researchers to the workshop. I asked the stewards and the researchers to answer the question: Given the scale of the environmental and social problems we face, what difference do small restoration projects make? Here are some of the answers they came up with. Brandeis University sociologist Carmen Sirianni sees civic ecology practices as part of a larger civic renewal movement. He noted that the coalitions of stewardship organizations working together on watershed and other restoration projects build participants' civic capacity to engage in additional civic actions. And through forming partnerships with larger non-profits and government agencies, these efforts can influence local and sometimes regional or even national environmental policy. U.S. Forest Service social scientist Erika Svendsen researches how city-wide coalitions of stewardship organizations exchange ideas and resources through dynamic social networks. She has discovered that some organizations engaged in civic ecology practice -- like Greening of Detroit -- are particularly important nodes in these networks. They serve as "bridging organizations" bringing together groups working at different scales and in different places. They also serve as "brokers," helping civil society, business, and government to hammer out agreements on use of open space in cities and elsewhere. Looking forward, Drew University professor of sociology of religion and environmental studies, Laurel Kearns, asked us not to forget the power of religious organizations engaged in civic ecology practices. Religions have shared value systems that incorporate justice, caring for one's neighbor, and caring for God's creation. Those who attend church, synagogues, temples and mosques may also share in practices around gardening and food, health and healing, and simply volunteering. And they often have the trust and social ties -- the social capital -- that is so needed for people to commit to collective action. Because of their critical role in "delivering" civic ecology practices, professor Kearns refers to religious organizations as the environmental stewardship movement's "midwives." And after listening to the stories of the civic ecology stewards, Emory University Professor of Environmental Sciences Lance Gunderson had this to say about the larger implications of their work. "Ideas drive policy. Politicians follow ideas." (And to prove Professor Gunderson's point, Senator Barbara Mikulski recently tweeted about the Maryland Coastal Stewards: "Be sure to remind them that the @CoastalStewards have a champion on The Hill!"). Are small acts of caring for nature and community the answer to the larger social and environmental problems we face? No. But we don't know the answer. Civic ecology practices are one among many needed experiments. Such experiments -- or social innovations that arise from the ground up -- gain in importance when we don't know how to do things right. Because in integrating caring for community and nature, these and other "do-gooder" civic ecology stewards are, as Spike Lee said, "Doing the right thing."